Going to church is something that I like to do for many reasons. I don’t go to church for any other reason but to get closer to God and to help me with my walk with the Lord. One of my favorite verses in the Bible is from Ecclesiastes 3:1-15. These verses talks about the shortness of seasons in our natural and spiritual life. Just as spring leads to summer and summer into fall and winter, so are the seasons of life. Some changes come over a long period of time and others seem to change by the minute. Nothing remains the same forever, except God. So, make up your mind now, change is inevitable. Everything changes and churches do too. Changes can be a positive or a negative experience. I find it interesting when I hear people grumble about petty things at church. I am no exception to the grumbling. I have more than done my share of it. But during one of Pastor Deans sermons, I got to thinking about how blessed I am to be at our church where we can worship God freely. I don’t doubt for a second that every church has made changes when pastors, parishioners and so on have had to make changes. Our church is no exception. We are surrounded by ever increasing changes in technology, music and education. For some reason in our Christian life, and in the church, we fight change. We want things our way and the control freak seems to come out in people. God’s plan not only includes change, it is change. But we all, with open face looking as in a mirror the glory of the Lord, are changed into the same image from glory to glory, even as by the Spirit of the Lord (2 Corinthians 3:18). When I talk about change in the church I get the idea that many believe it is for everyone else. There is this mindset that we must put on this show that is like going to a concert each week. We gripe and moan when the praise and worship team introduces a new song, or we find someone sitting in our seat when we arrive for church. But, one of the greatest challenges seems to be changes of church leadership and decisions to take down ugly fake flowers cluttering the front of the sanctuary. Change for the small church is often difficult, feared and resisted because it involves breaking habits and routines from the past and the uncertainty of the future. People resist change for a variety of reasons. Some of these reasons are valid, some are ridiculous, some are reasonable, some are irrational, some are significant, some are trivial. Just as a small portion of the people will be open to change for any reason, there will be some who resist change regardless of the reason. Some can be extremely vocal and against any change. A couple of phrases they use is, “It will never work or we never did it this way before.” Some will find reasons why it will not continue to work. I understand that every church will likely have these types of people. Thankfully Pastor Ray and Kathi are loving, caring and kind. I would bring a hammer with me to knock sense into people and they use the hammer of truth and love. Good thing I’m not the pastor, lol. I have loved all of the pastors that we have had at our church for the 19 yrs since we have moved here. Well, except the crazy one. Each and everyone of them has made changes. I may not have understood them, but they have. For those people who think things have to stay the same I would say they are stuck in the mud and need a wake up call. What kind of an attitude should we take when it comes to changes? I honestly don’t think it is healthy physically or spiritually to always grumble and clinch our teeth. Change is a time that we should be enjoying and looking forward to. If we look at change in a positive way, there is nothing better. In general there have been a number of changes in the past year. Some are small while others are much bigger. The old timers and those who have been at our church for some time are not always impressed with changes and kids. They want things they way they were when they started to go and that is NOT going to happen. Life is all about changes and so is church. Over the past year we have gotten a new pastor, sold a organ, redoing our downstairs prepping for youth ministries, getting a baptismal, decorations and tossing out the clutter. I love the fact that we have a wooden cross for the sanctuary. These are just a few of the changes. Our church has had VBS for the first time since I have been there, prayer stations put in place to reach out to college students and so much more. For some they can’t get over the fact that the curtains were taken down that cover the beautiful stain glass windows we have in the sanctuary. The banners that were on the wall in the sanctuary are now down. While I love the banners, I do have to say that since they came down, many look forward and listen to the sermon more. If people are worried about curtains, banners and other things, they are going for the wrong reason. I often think of our pastor and his wife Kathi. I can’t imagine what it must be like for them to come to a new state and church. They left behind their friends and congregation. They took a leap of faith by coming to St. George, Utah. And we have been blessed to have them. I get upset at people when they forget that pastors do have wives and that we need to take them into consideration. I know it had to be hard for them to start over and leave behind those they loved and a denomination they have been with for 20 some odd years. For some reason people like to put the pastor and his wife on a pedestal and expect them to be displayed in a way that is unrealistic. I can’t help but get frustrated when I hear this comment, “We always did it this way, why change?” Well!!!! When I think of how change can be positive I think about how we are to rejoice in the Lord. We are to praise God each and every day. When we praise, we are erasing doubt and fear. As Christians I think we should be looking ahead at what God is and can do in our lives. I don’t want to focus on the past and not move forward. For myself, there has been a great deal of bad things in the past. I do take those lessons I have learned from the past with me to the future. But I don’t let them dictate and control my future. And, in the church as a whole, we can look back, but we don’t let our past control what we do in the future. If those who are more worried about curtains, hangings and the notion that we never do that here, then they are going for the wrong reason. Many times the changes that come into our lives happen for a reason. Changes undo what has been done and for some it may be hard to swallow or accept. Changes has a way of taking us to a new level. Church is like the limbs on a tree. They need to be cut back and pruned in order for them to produce healthier fruit. We shouldn’t live today like we did in the past. Today is a new day and season. With changes there is a renewed strength and growth within us and the church. 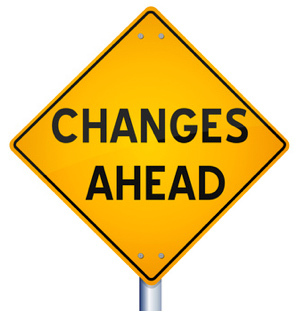 Some changes are welcomed, some changes are not easily embraced, even though they may be for the better. There is also a time for preserving the status quo. We, as the body of Christ, need to be flexible, and just like our physical joints, as they get older, our adaptability joints lose some of their flexibility.